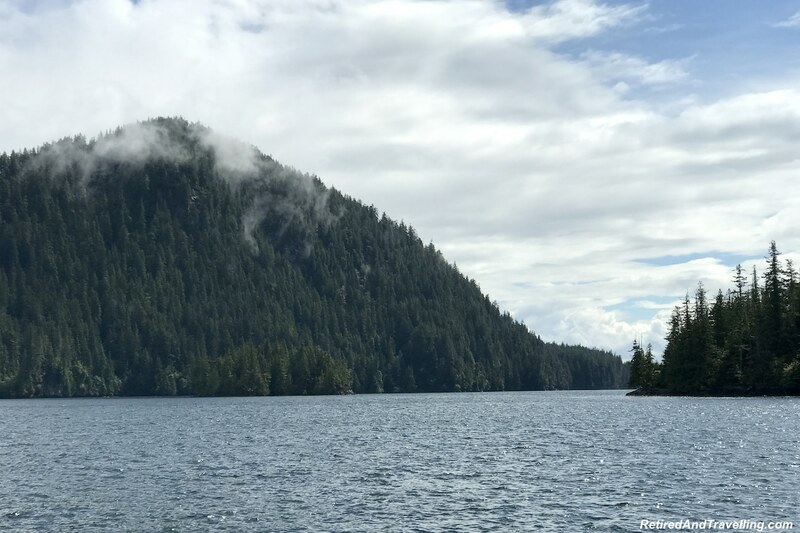 We left Seattle and spent one day cruising up the Inside Passage along the coast of British Columbia in Canada. 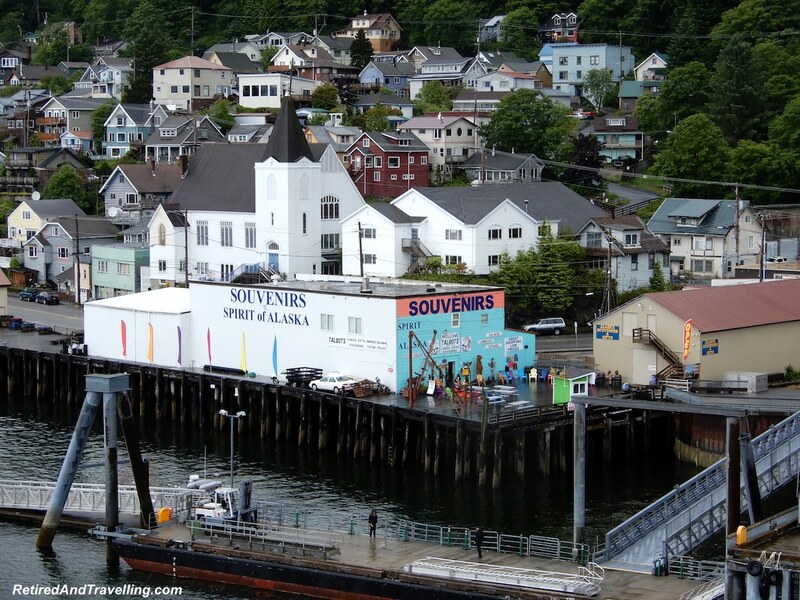 The first port on our Alaska cruise was Ketchikan. 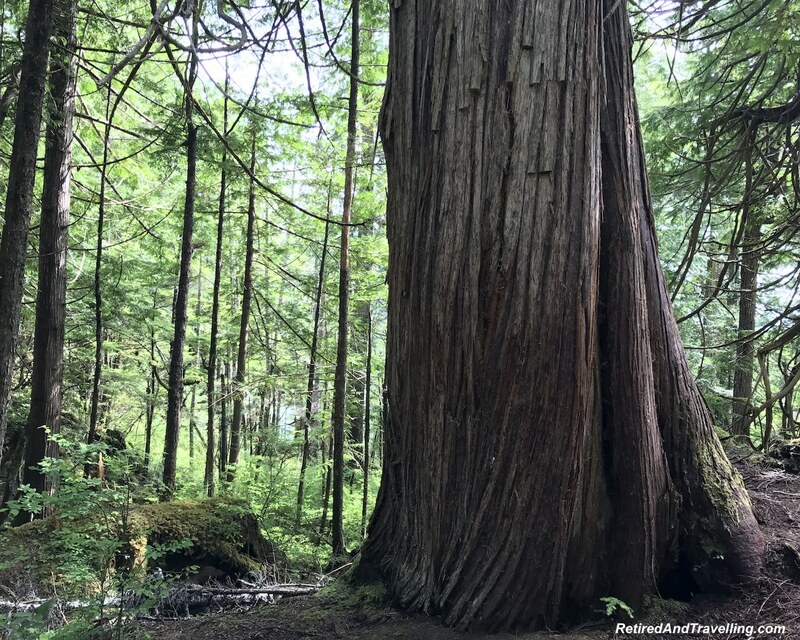 We booked a rainforest excursion in Ketchikan as our first taste of Alaska. The weather forecast was variable. 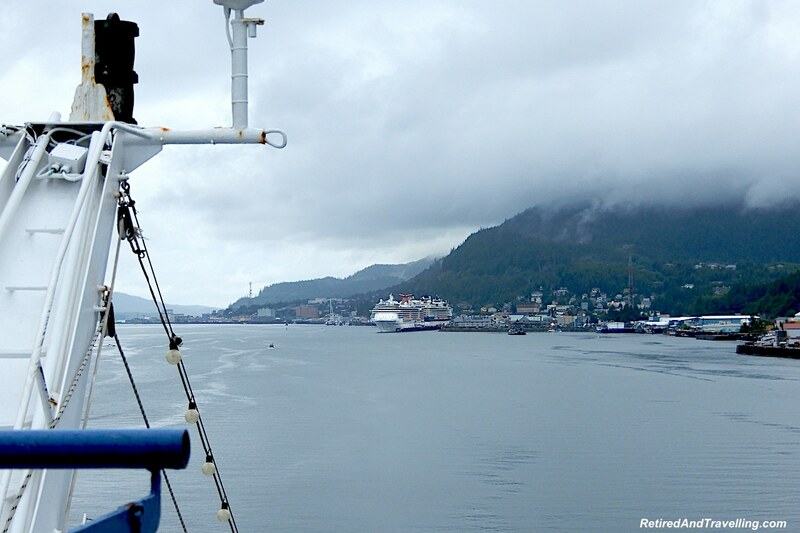 During our morning cruise into Ketchikan we kept updating the forecast. 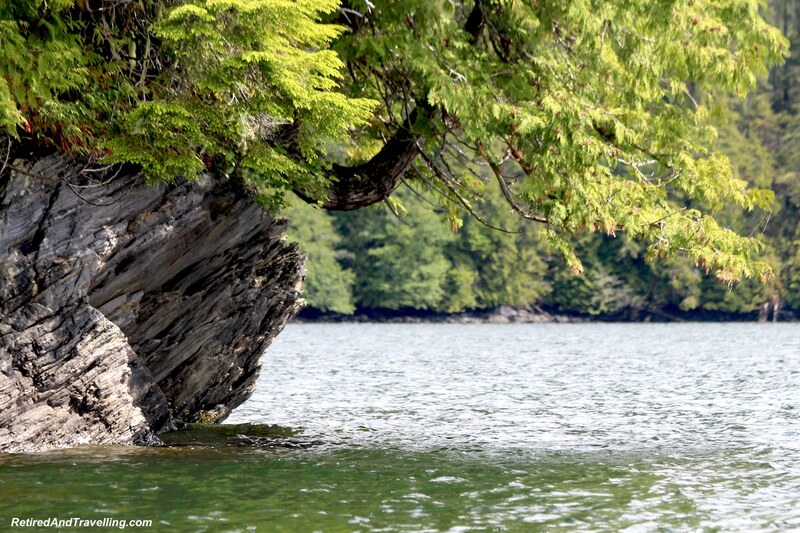 A boat ride and a forest walk would not be an ideal excursion in the rain. 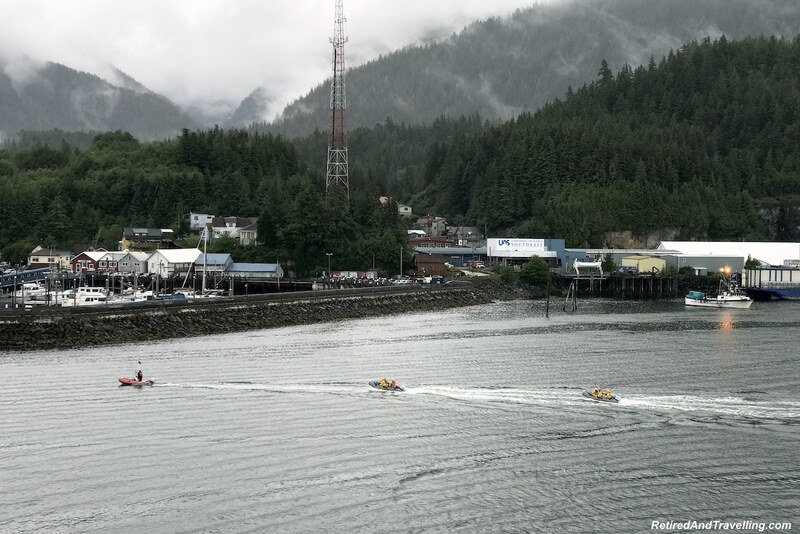 Our slow transit through the inside passage put us in Ketchikan just before noon. The clouds sat low over the small harbour town. As we neared the dock, it was clear we were not alone in this port. Three other large cruise ships were already docked. This included the Celebrity ship my friend was cruising on! 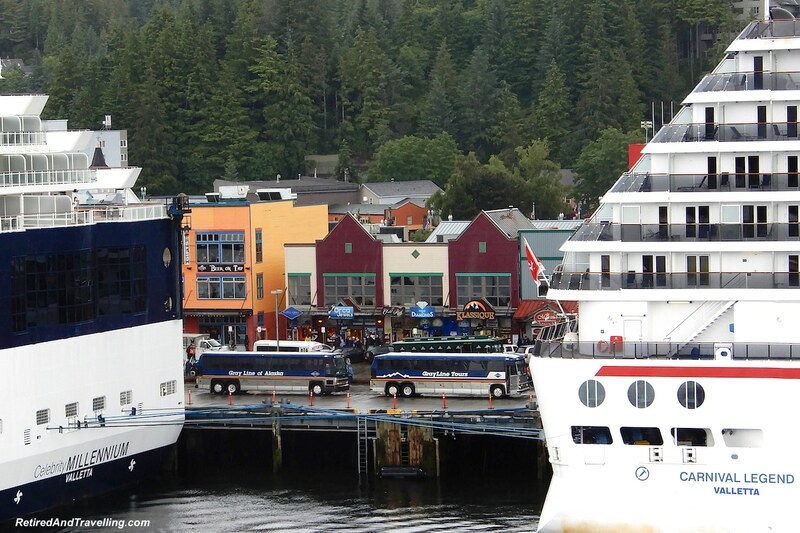 Much of Ketchikan is owned by the cruise ships. There are the standard cruise port shopping spots for jewellery. We docked away from main port and there was a small souvenir shop on the dock. 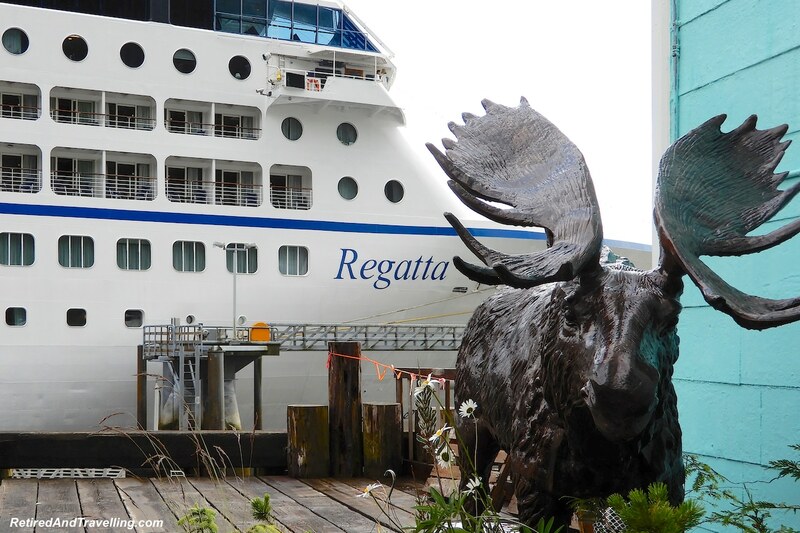 It has the best prices that we found on our Alaska cruise. My fleece-lined waterproof jacket was only $22USD! There were also a number of local tours available from this dock if you did not book an excursion in advance or with the cruise ship. 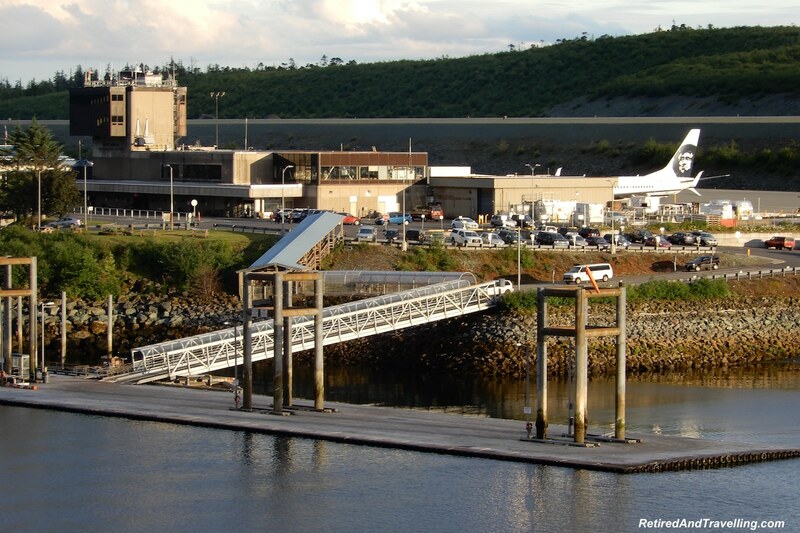 The first cruise excursions that sold out for this port were the float plane trips. It seemed to be the most popular activity in this area. Every minute or two we saw a float plane land on the water. 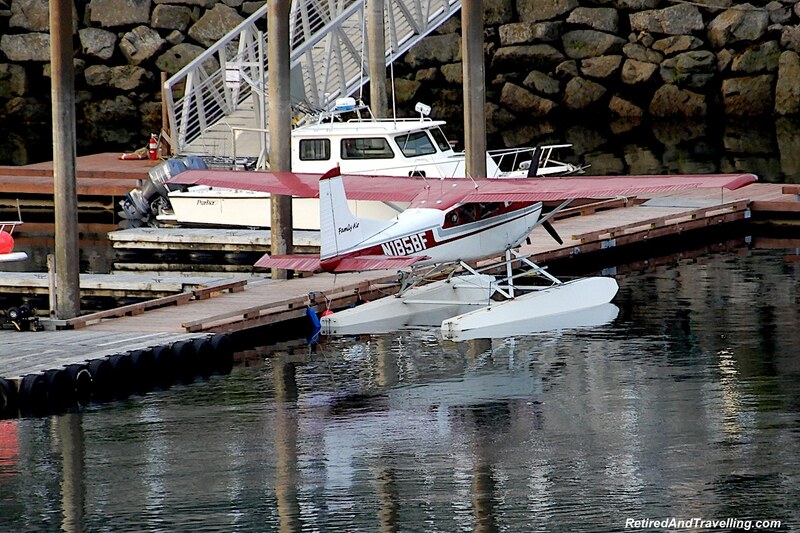 Every dock seemed to have one or more float planes docked. Some were docked beside the boats! There were several helicopter tours offered as well. 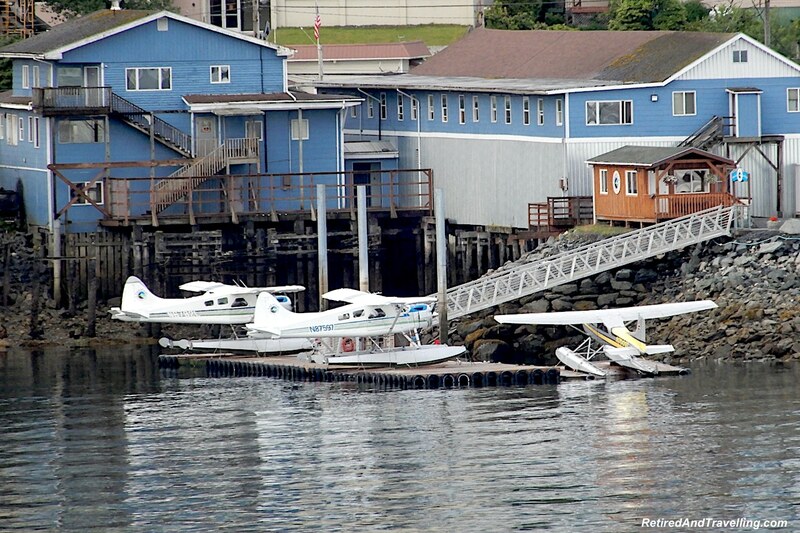 There is an international airport in Ketchikan with a seaplane dock. 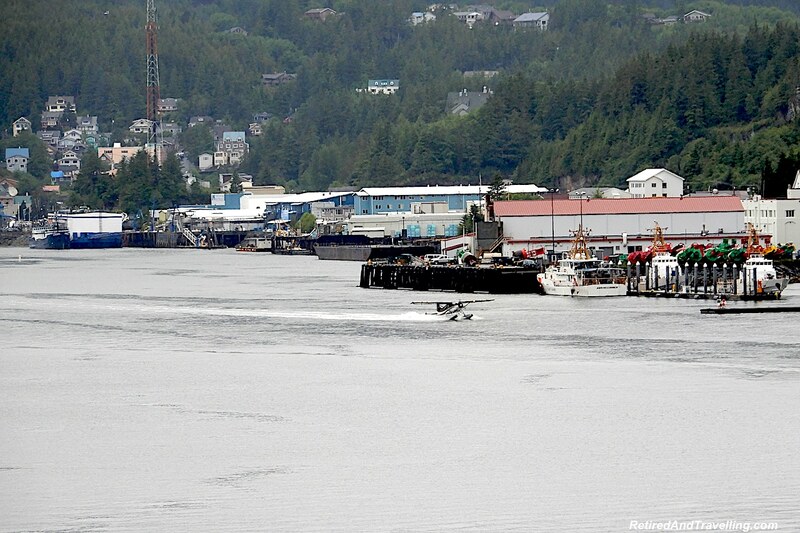 If you are visiting somewhere else in Alaska, you may be able to fly in for a visit. If the air tours are all sold out on your cruise ship, try and book a tour yourself. 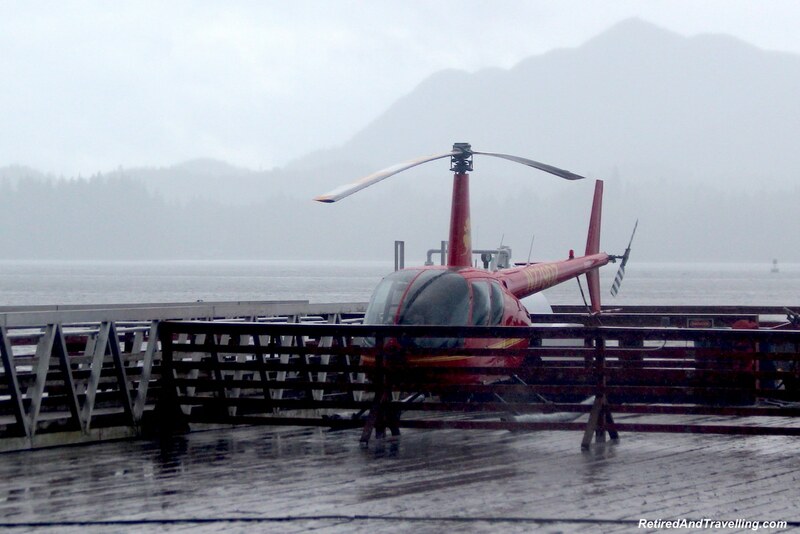 This might be a quite different way to do a rainforest excursion in Ketchikan. 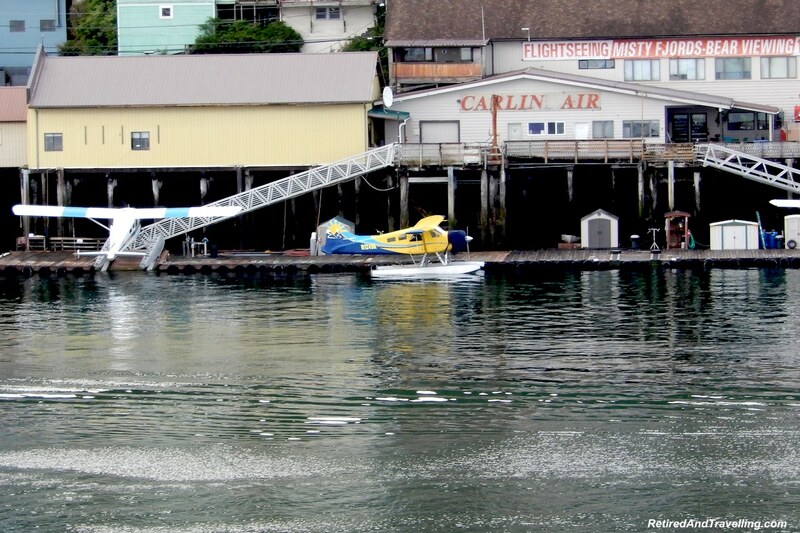 The sea planes can land almost anywhere. We heard several people talking about the plane trip they booked. Be aware that there are weight limits on small planes. That may restrict how many can go in a small plane. Book well in advance of your trip. If there are a lot of cruise ships in port, capacity may be limited. There is also the risk that the weather may ground the plane or limit what you can see. 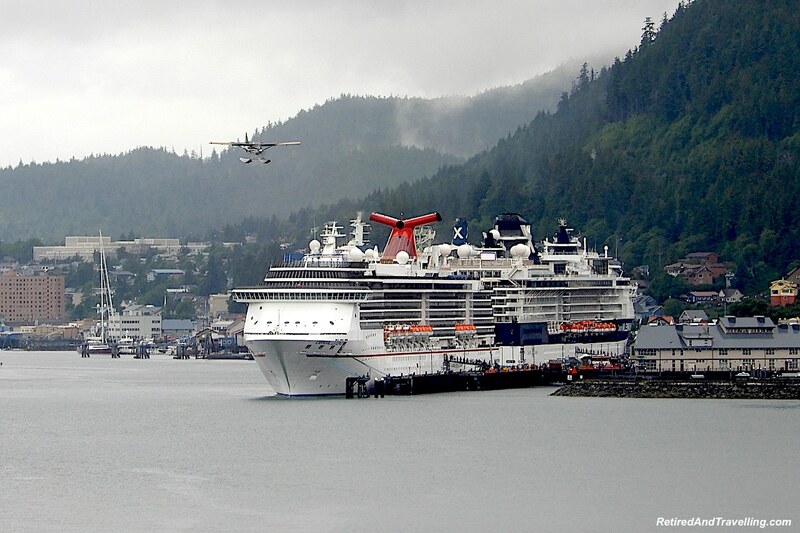 It was drizzling and the clouds were pretty low but the planes still flew when we visited Ketchikan. 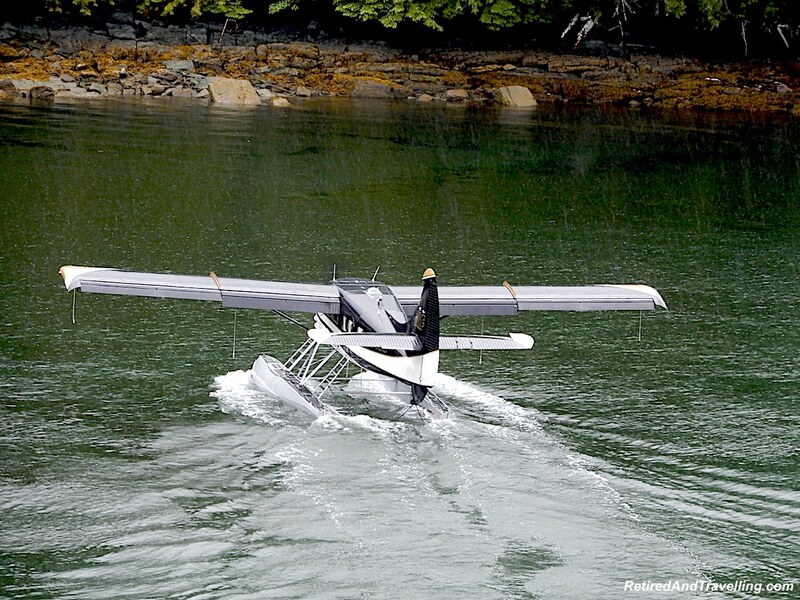 Just have a backup plan in case your float plane tour gets cancelled. 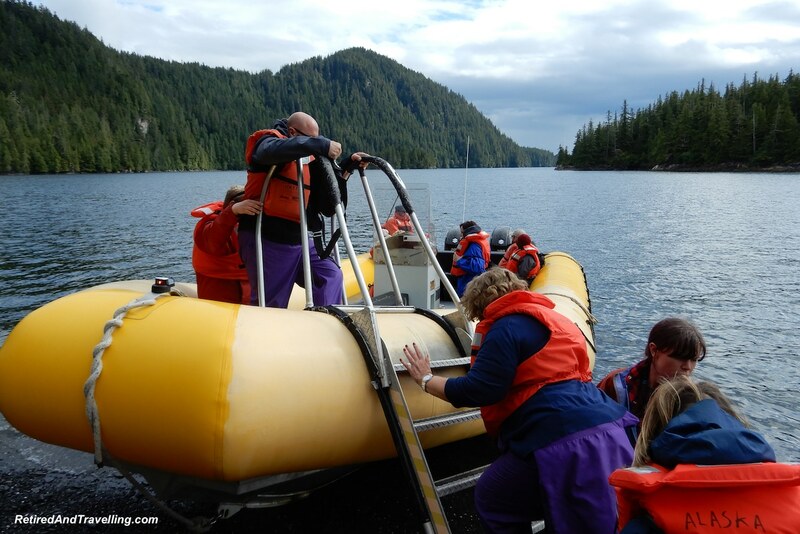 We boarded a bus on the dock and headed for Knudson Cove for our rainforest excursion in Ketchikan. Our great driver provided us with a running commentary on the scenery we passed. We learned about the native history of the island. His rambles were peppered with local jokes. The driver we got on the return trip seemed to be reading from the same script but was nowhere as entertaining or educational as our first bus driver. The bus pulled into the marina. 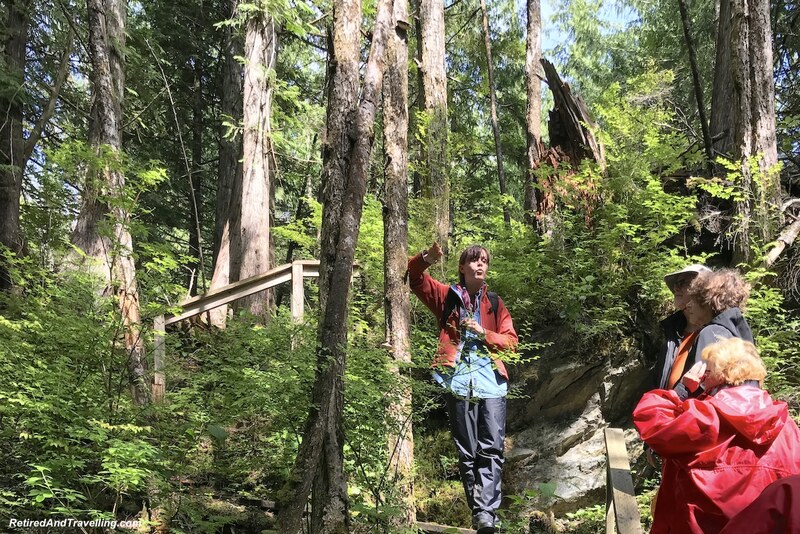 We were directed to get outfitted with rain gear for our rainforest excursion in Ketchikan. The group was dressed in a colourful assortment of outfits. 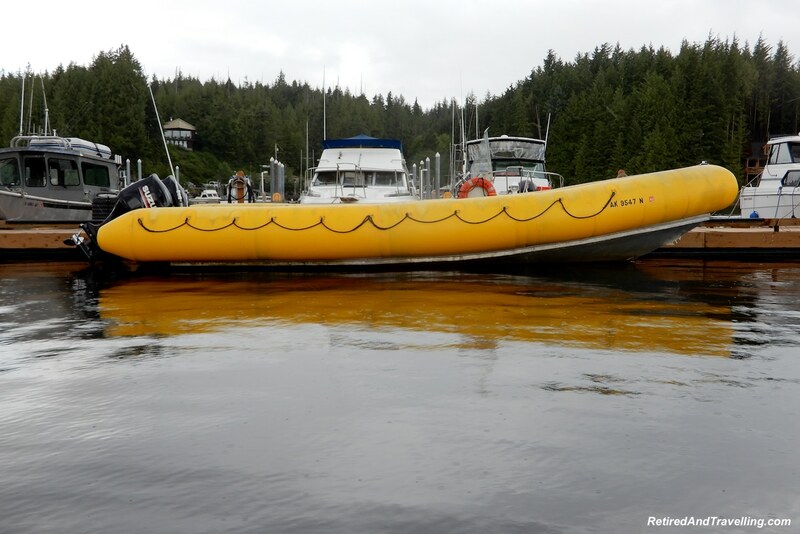 The bright yellow boat waited for us at the dock. We bounced our way over the inflated side and got settled for the ride to the island. 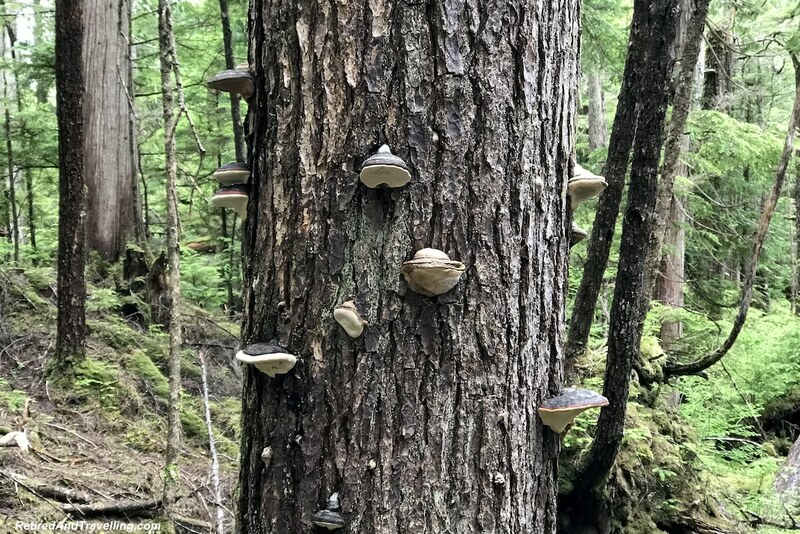 It was about a 20 minute ride to and from the uninhabited island for our rainforest excursion in Ketchikan. We could see the many tree-covered uninhabited islands as we passed. We actually picked this excursion because of the tease of seeing a wide range of wildlife on the boat trip. But our boat driver drove to the island without slowing at all. If there was something to see, it passed by too quickly. 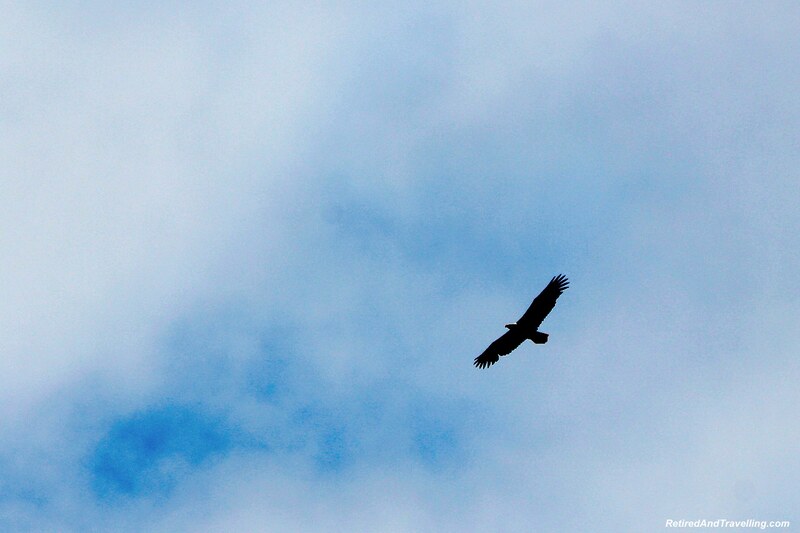 On the return trip, David spotted a large number of Bald Eagles. He needed a really fast lens to catch them as we sped along. 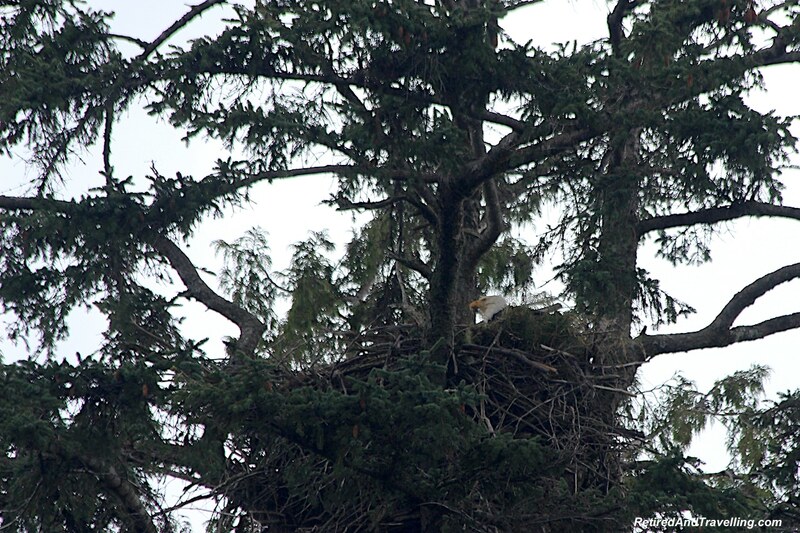 We did finally stop at Eagle Island where a large nest was pointed out. Someone said they saw a sea lion but most of us missed it. 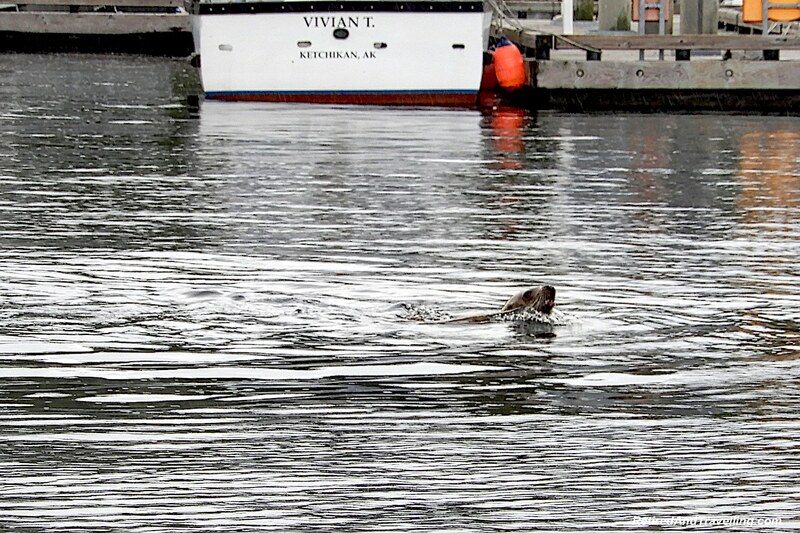 We finally caught a few sea lions frolicking in the harbour when we returned at the end of the trip. 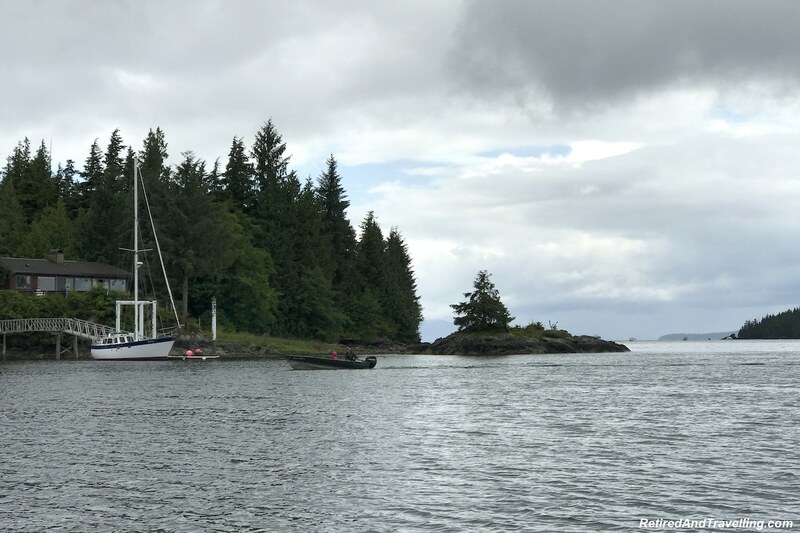 The boat pulled up to the shore and a ladder was put over the rubber side. Thank goodness for these Aluminum Dock Ladders. If it wasn’t for inventions like these, I don’t know how myself, or anyone for that matter would make their way safety into a boat. There are so many things we take for granted, and this is just one of them. But I am grateful. The guests made their clumsy way over the ladder and onto the beach. 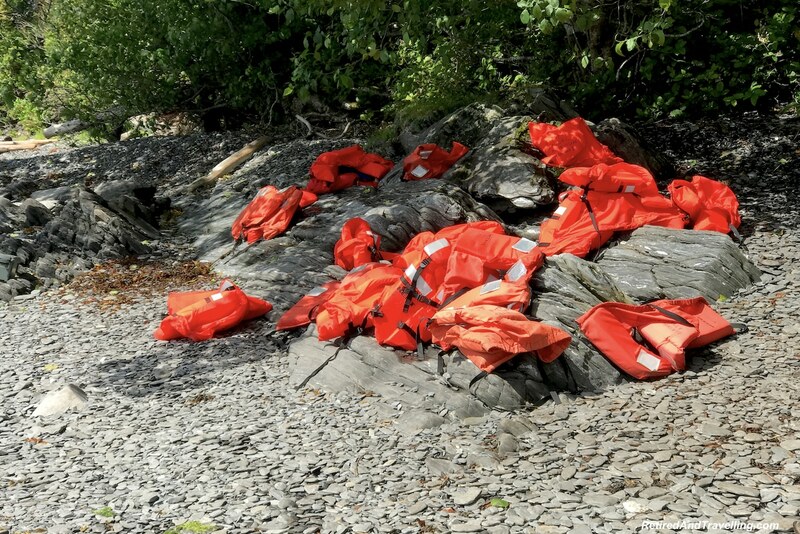 The life jackets were piled under a tree for the return boat trip. There was a short discussion about sea life on the beach. 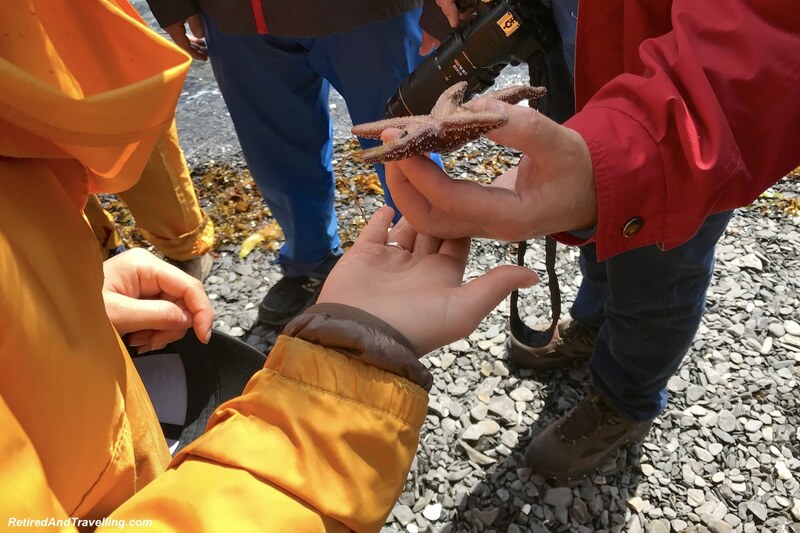 Several guests got quite freaked out when they had a chance to hold a star fish. 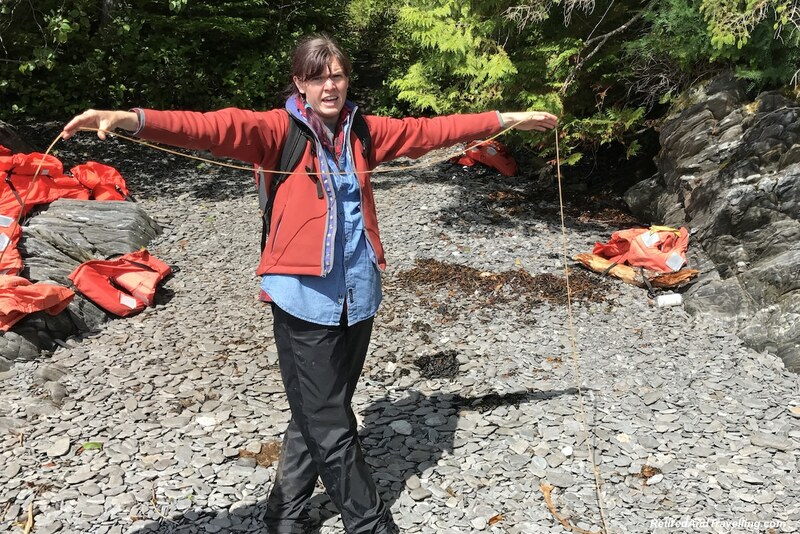 Our guide showed us several types of kelp that had washed up on the beach. 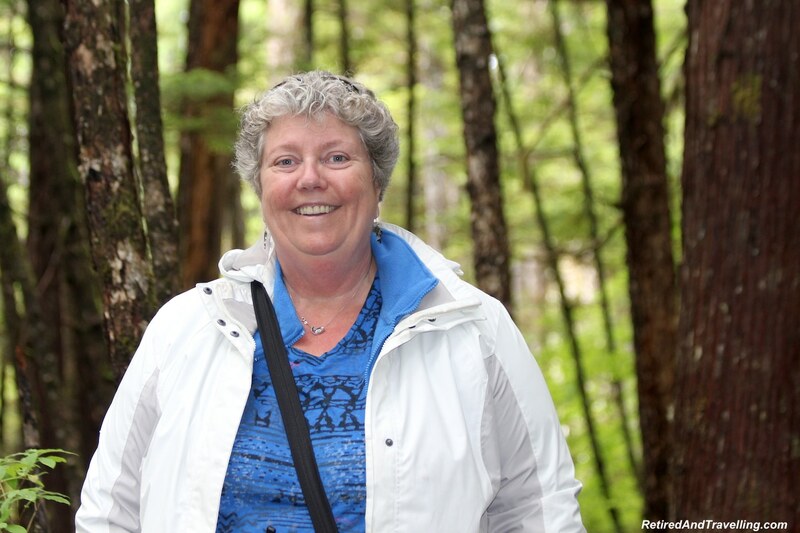 We then headed up for our rainforest excursion in Ketchikan. 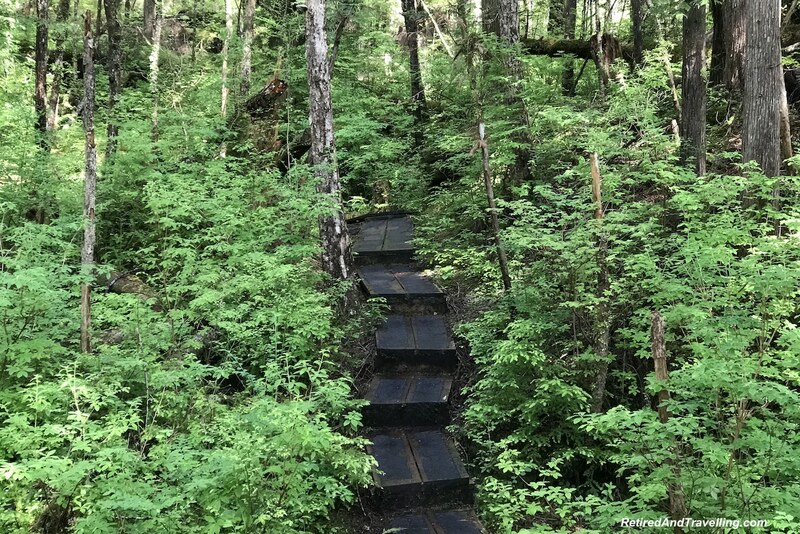 The tour description talked about a walk through the rainforest on a boardwalk. What it did not mention was that boardwalk sections stretched between stairs. It was a good climb up until we hit the highest point. Our guide stopped regularly to talk about what we were seeing. And to let some people catch their breaths! 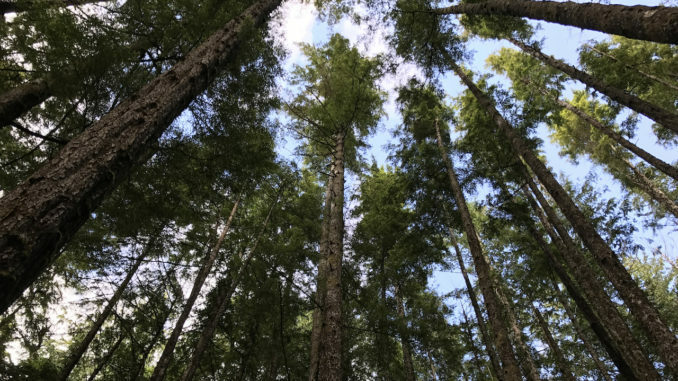 Along the way our guide stopped to show us the large trees still left in the forest. We also saw a large number of nursery trees. 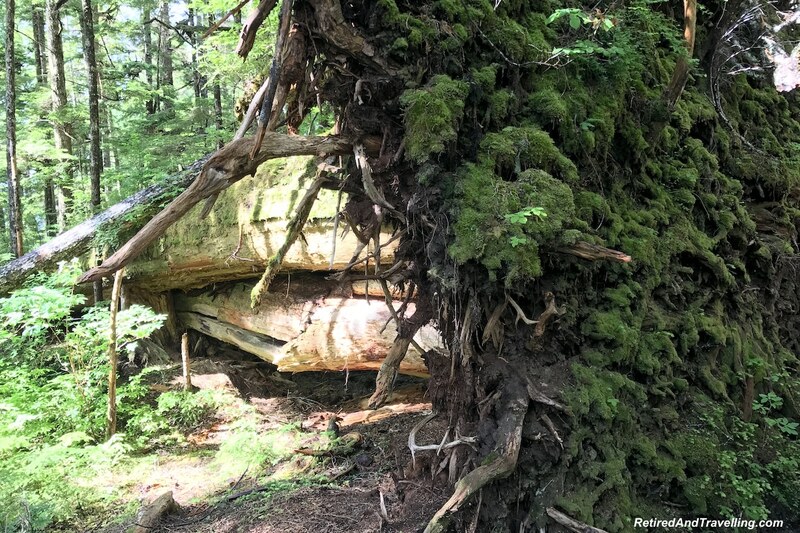 These are trees that have fallen down and are now being used as food for new growth. 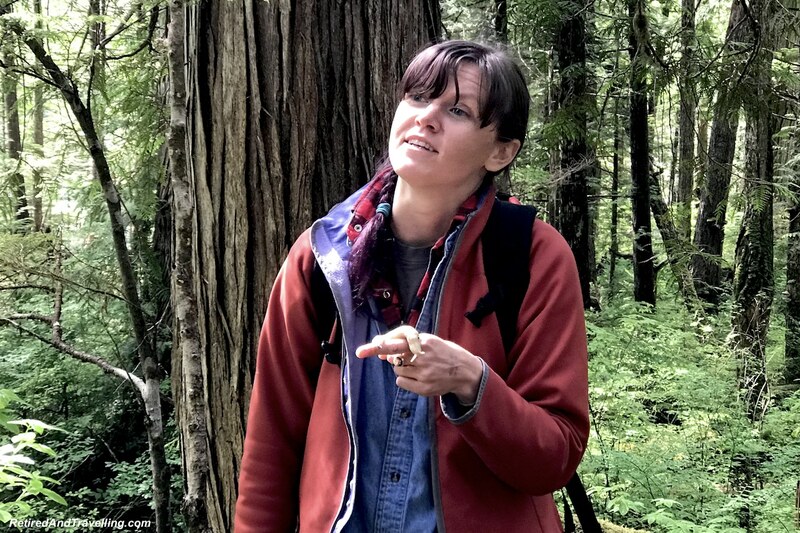 At one point we stopped so that our guide could show us a banana slug. She got one volunteer when she asked for superstitious people. 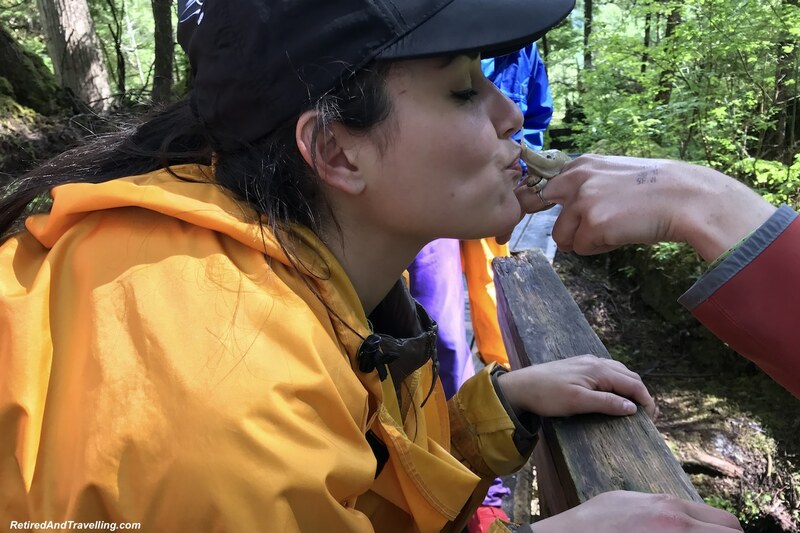 She said it was good luck to kiss a slug. The volunteer took up the challenge. This was much to the shock of her watching mother! We finished our rainforest walk downhill back to the beach. A bonfire had been lit and we were served small snacks. 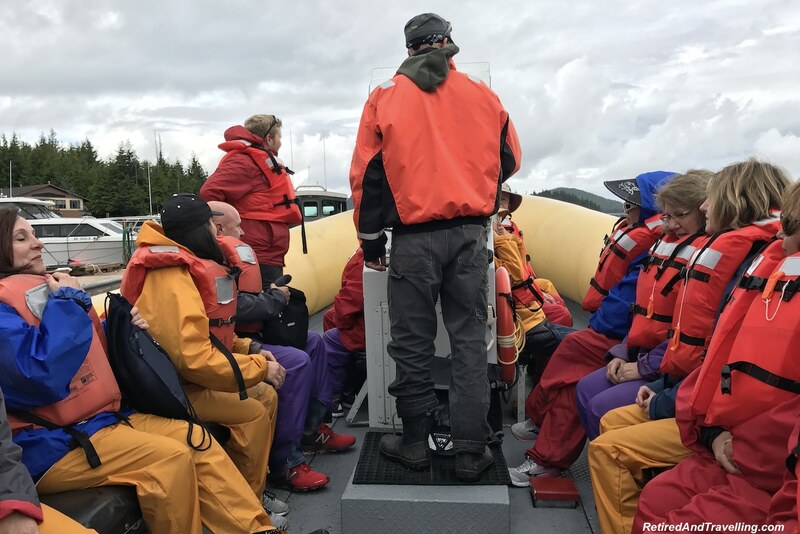 Then we donned our life jackets and climbed back into the boat for our return transit. 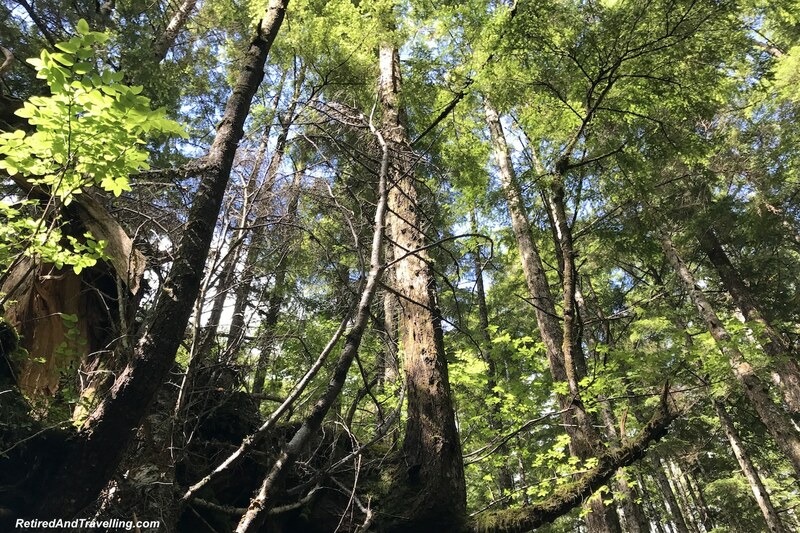 We got very lucky with the weather for our rainforest excursion in Ketchikan. It rained a bit on our bus ride but then held off for our boat ride and rainforest walk. 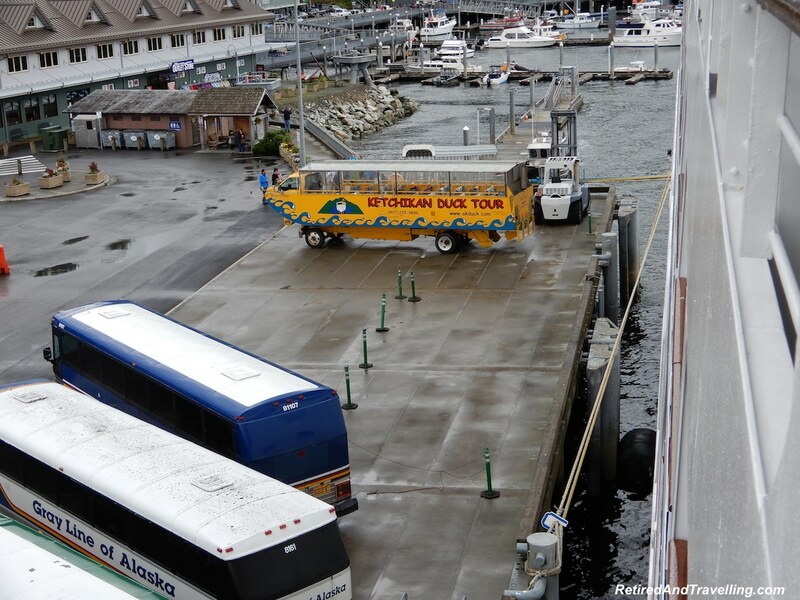 On many of the other tours out of Ketchikan, guests returned soaking wet. We got a good chance to see the local rainforest. 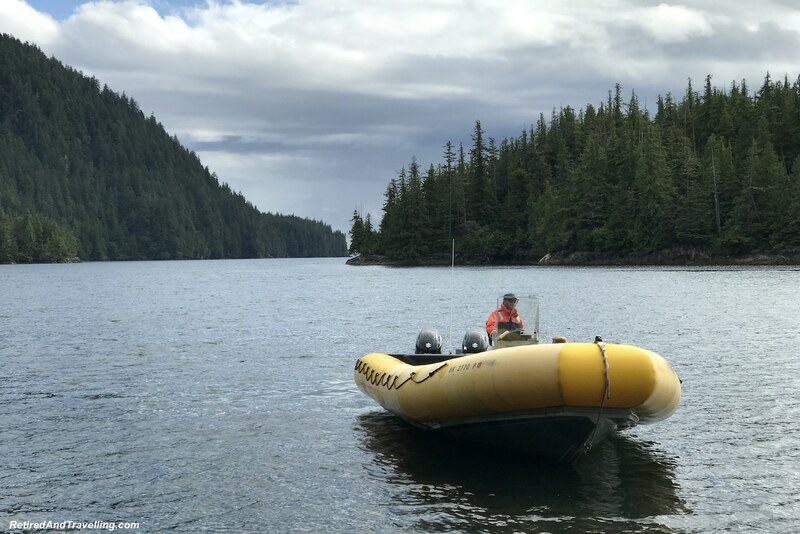 Most of the islands are uninhabited so we saw Alaska’s unspoiled beauty. We did not get the wildlife sightings the tour description seemed to suggest. But it was a good trip out into nature. 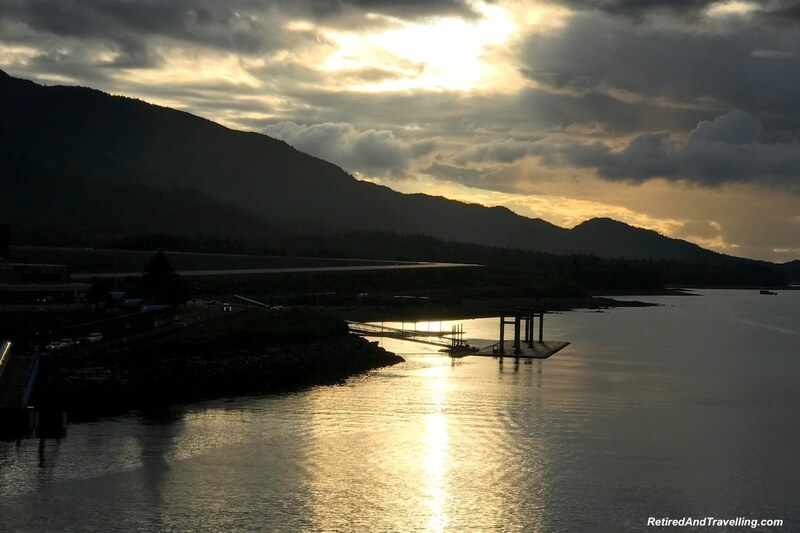 The ship left Ketchikan early in the evening. We got a great view of the sun setting. The next day we would not be in port. The ship was scheduled to cruise up the Tracy Fjord to the Sawyer Glacier. 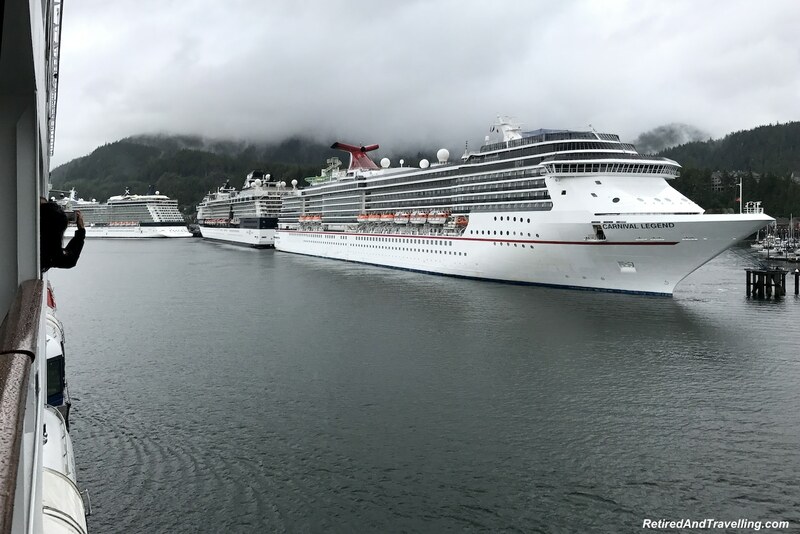 We really hoped for a great day to see this facet of our Alaska cruise! 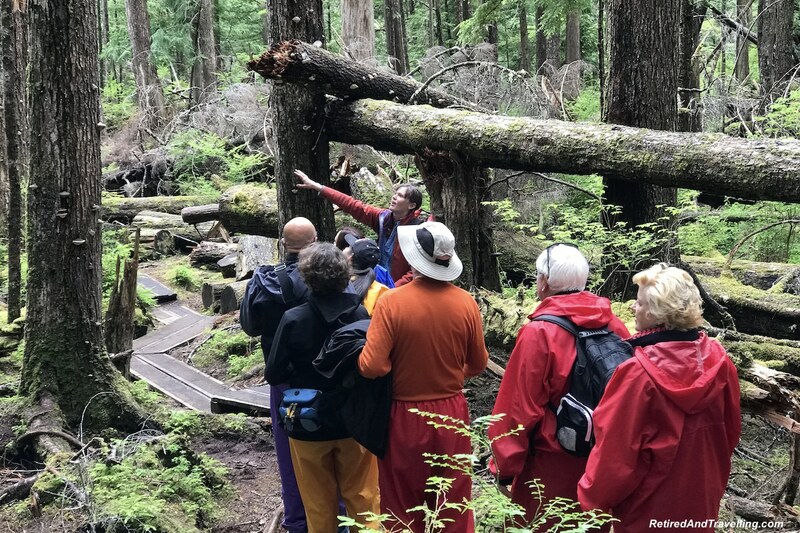 Have you done a rainforest excursion in Alaska? What did you find most interesting?